Satin-finish stainless steel. Flush tumbler lock. 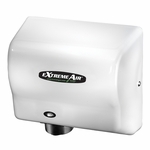 Dispenses 350 C-fold or 475 multifold towels. Waste receptacle has 3.0-gal, (11.3-L) capacity. Extends 2-1/2" (65mm) from wall. Removable front panel for easy cleaning. TowelMate consisting of a 90° return towel guide angle inside cabinet to prevent paper towels form falling out when door is opened for servicing. Nylon rod across the center of the towel tray to dispense paper towels one at a time. LinerMate can liner holder to facilitate installation and removal of disposable trash liners and retains liner inside waste receptacle.